If you are a racing bike enthusiast, you would have probably heard about steel, aluminium or even the expensive titanium material for bicycle frames already. The latest in technology has made some materials even better. An example of such material is the carbon fibre. What is carbon fibre? Some people would prefer to call it by its scientific name, thermoplastic. Unlike the conventional materials, carbon fibre offers big potential for the future of bicycle materials. In its early development, carbon fibre was not favoured. There were problems with the bending of frames and frames which had aluminium lugs. There were also additional disasters like the failure of adhesive methods due to the limited technology at that time. This material is a type of polymer. Therefore, the formation methods are very important in producing a high-strength thermoplastic. There are many kinds of construction techniques. The most common method is by mixing sheets of carbon fibre fabric together with both sides of the mould. Then, a process called curing ensues. The result is a monocoque carbon frame. Monocoque utilizes the exterior structure to support the overall weight and stress induced to the bicycle. Why is this type of construction method so popular? That is because it provides excellent protection against vibration and high efficiency when paddling. 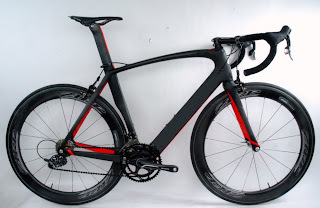 Why should you choose carbon-fibre type of material for your bicycle? You would want a carbon-fibre type if you are looking for the highest stiffness and strength to weight ratio. But you should also be prepared to fork out more money in the process. It is the latest breakthrough in bicycle frame advancements. Carbon fibre is a lightweight material that makes bicycles lighter, faster and easier to transport. Its bicycle frame is incredibly durable and also great for absorbing shock.